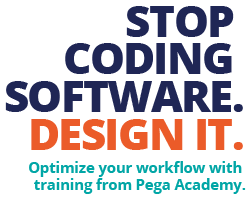 Pega Academy's training options offer the flexibility to learn at your own pace in the format that works best for you. Gain the knowledge and hands-on experience you need to successfully design, build and deploy applications with Pega. Dynamic content – delivered straight from the expert minds at Pega. Accelerate your future with design and implementation best practices - empowering you with the skills to start developing Pega applications. Get hands-on. Lesson exercises bring you directly into the product. Explore the power of the platform or the accessibility of an application with the ease of the cloud or a portably packaged download. Get powered up for your next project. Pega Academy certification paths guide you to becoming a Pega Certified Professional. The Pega Professional Certification Program ensures that qualified individuals are recognized to have the skills and knowledge necessary to successfully implement Pega’s products. Pega-certified professionals join a worldwide community committed to excel in optimizing the value of the Pega platform to deliver breakthrough outcomes with world class applications. Our training allows you to gain the knowledge and hands-on experience you need to successfully design, build and deploy applications with Pega. Pega Academy has training centers located across the globe. Get your team the expertise they need with Pega’s collection of training content. Choose from online training or instructor-led training – both cover the same topics and product knowledge. Learn from certified experts as they demonstrate building applications step-by-step; then, apply your new skills directly in the product with hands-on exercises. Online training content is presented in modules and courses – a module is one lesson group with focused content on one theme and is 15 minutes to 2 hours in length; a course includes several lesson groups and is over 2 hours in length. Pega Academy has created a worldwide community of thousands of Pega Certified Professionals, drawn together by their commitment to excel in their ability to optimize the value of Pega solutions. Based on your interest, role or certification path, you can register for one of the exams below and become a part of our growing professional community.